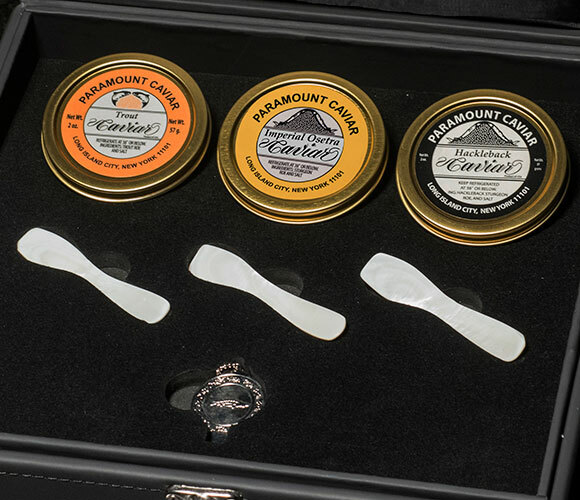 Sign Up and Save with our Assorted Caviar Trio Set Subscription! 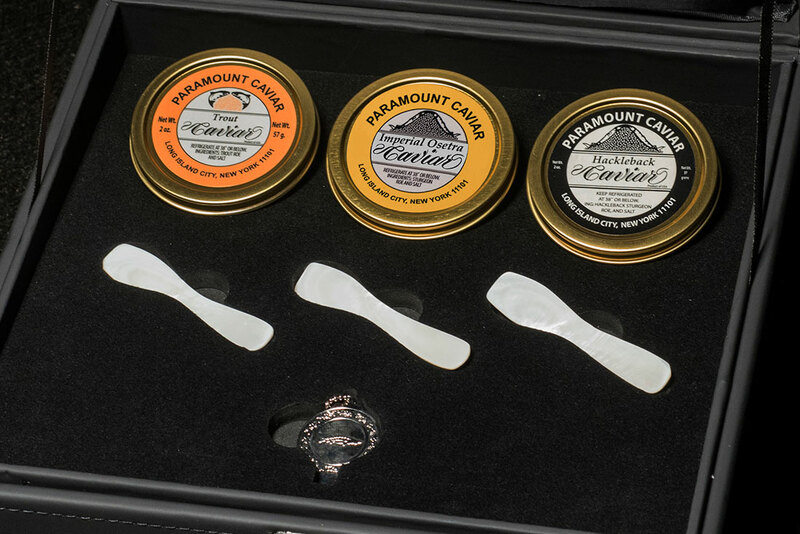 You will receive The Ritz-Carlton's Assorted Caviar Trio Set every month. You may cancel at any time. 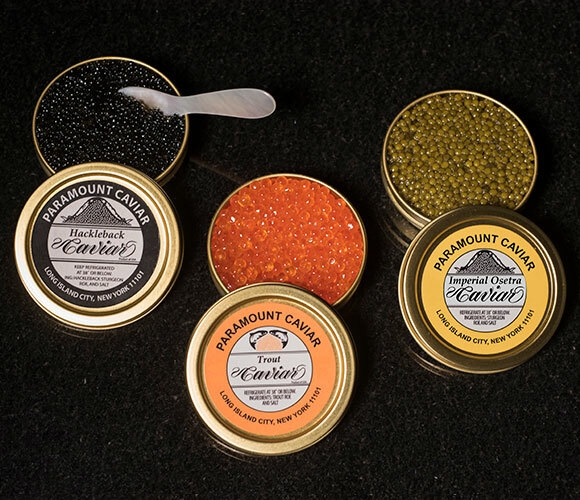 Curated by The Ritz-Carlton culinary team and featured in many of The Ritz-Carlton restaurants, our top-quality caviar is hand-selected from around the world. 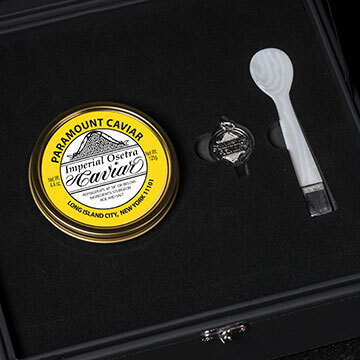 The Assorted Trio Caviar Gift Set features three 50g tins including Imperial Osetra Caviar, Hackleback Caviar and Trout Caviar. 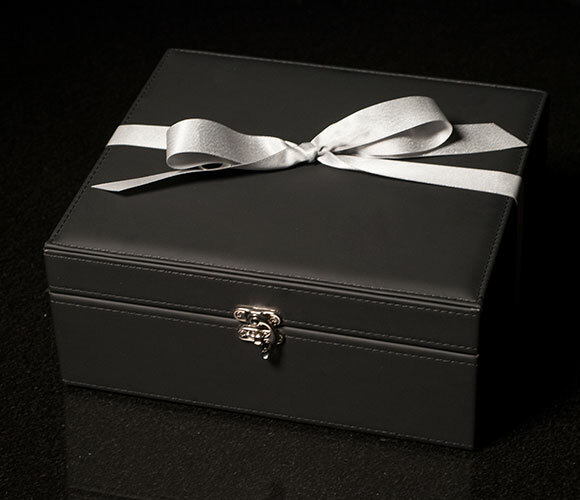 The trio arrives in a beautiful, custom-made gift box along with three Mother of Pearl spoons and a caviar key. 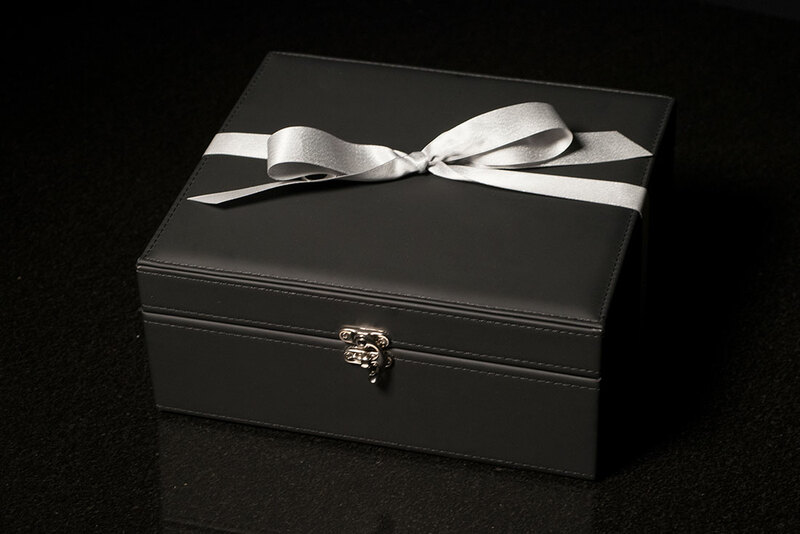 Set includes 50g each of Imperial Osetra, Hackleback, and Trout caviar, 3 mother of pearl spoons and a caviar key with chain; Packaged in a custom black gift box wrapped with a silver satin bow; Ships chilled with food safe gel ice via overnight delivery; Refrigerate upon receipt to ensure fresh state; Do not freeze; Products made in the United States, Asia and Denmark. The premium Imperial Osetra Caviar, sustainably farmed in Asia, features medium to large pearls with gray to dark gray color, medium firmness and a classic, nutty flavor. 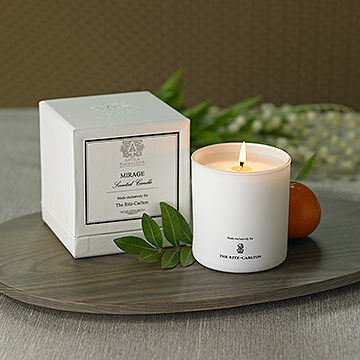 Harvested from wild Hackleback in the United States, the Hackleback Caviar features small-medium pearls with jet black color, medium firmness and a buttery, sweet flavor. 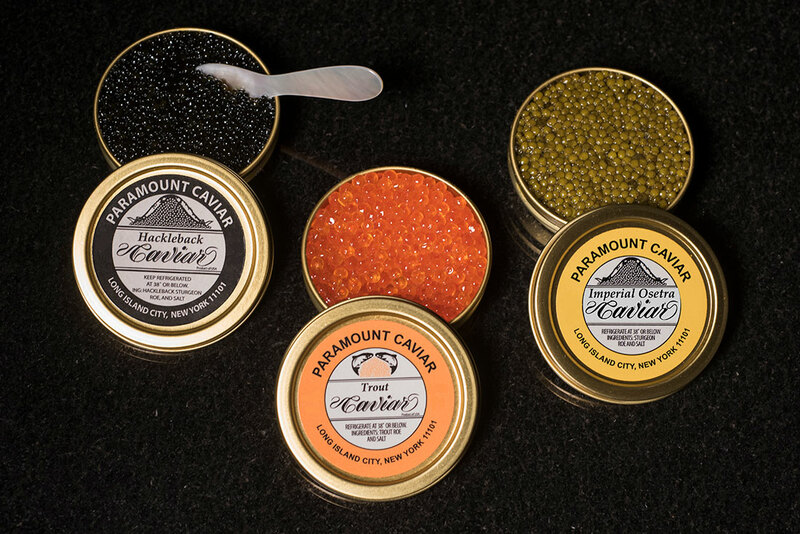 The Trout Caviar, sustainably farmed in Denmark, features medium pearls with orange or yellow color, extreme firmness and a clean burst of flavor. Shipping Details: Available to ship only within the Continental United States. 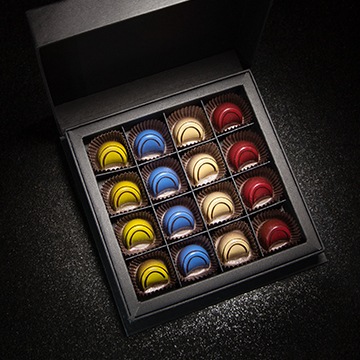 Place your order by 12:00 p.m. (noon) EST Monday-Thursday for next day delivery; Orders between 12:00 p.m. (noon) EST Thursday and 12:00 p.m. (noon) EST Monday will deliver Tuesday; Extended delivery lead times will apply for orders during the weeks prior Valentine's Day, Easter, Mother's Day and Christmas.